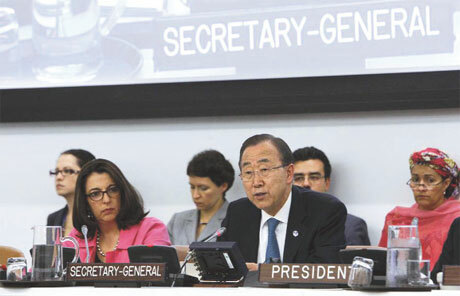 A HIGH-level panel appointed by Ban Ki-moon, the UN secretary general, will meet at the end of September in New York to deliberate on global development agenda beyond 2015, the target date for the Millennium Development Goals (MDGs). But before the meeting starts, the 26-member panel, which includes representatives of governments, the private sector and academia, is being criticised for its government-oriented structure and no outward intent to engage with the civil society. Civil society groups worldwide say they do not have adequate representation in the panel. Graça Machel, a founder member of Global Call to Action Against Poverty (GCAP), the world’s largest network of anti-poverty coalitions, is the only one appointed to the panel. The groups allege the panel has a tight deadline which will not facilitate wide consultations with people whose development will be charted out. The panel, co-chaired by UK prime minister David Cameron and Indonesian President Susilo Bambang Yudhoyono, has to submit its report by March 2013. The world committed to eight MDGs at a special UN conference in 2000. Though many termed MDGs as mild and framed without any consultation, the goals did influence development priorities of countries. As per an assessment of MDGs in July, the world has met three targets on poverty, slum population and access to water, while the rest five have to be realised. But with less than three years to go, there is a general belief that these five targets would not be met. In 2010, the member countries asked the UN secretary general to take up annual monitoring of progress of MDGs to enable an informed decision on the targets after 2015. So on August 2, the high-level panel was set up. The panel will work closely with an intergovernmental group on the sustainable development goals, set up at the Rio+20 conference. “I have asked my high-level panel to prepare a bold yet practical development vision to present to member states next year,” Ban told the media. To involve the civil society, within a week, the UN launched “The World We Want 2015”, a digital platform. For the panel, devising a new strategy for a more sustainable world is going to be hectic. The UN will conduct 50 country-level consultations besides unspecified number of events based on key themes like international migration and climate change. Feedbacks from these will go to the high-level panel to form the new targets. All this has to be completed by February next year to meet the March deadline. This is where the euphoria over the “bold” way forward on MDGs ends. Some influential networks of the civil society working on MDGs fear the panel will end up drafting misplaced targets. “First, the panel has just one representative from the civil society. Second, the panel will rush its agenda given the limited time. This will exclude people’s concerns and feedbacks,” says Amitabh Behar, co-chair of GCAP. In fact, the terms of reference for the panel do not include any provision for consultation. For many, the initiatives for the next round of goals are a repeat of the 2000 situation despite wide changes in world situations in past 12 years. “We will be facing new challenges without new approaches that are needed to tackle them,” says Amy Pollard, lead analyst at Catholic Agency For Overseas Development which works with the poor in 40 countries. The powerful panel has, however, definitely raised the seriousness of the issue. “The panel is inspiring, yet real change cannot come from one sector alone,” says Joanna Hoffman of Women Deliver, a global non-profit working on women and girl health. “The major danger that the panel must avoid is agreeing to a watered-down framework containing no specific targets,” says Brendan Cox, director of policy and advocacy at Save the Children, a non-profit that works for child rights.